Education is the foundation for a strong and vibrant nation, said Arunachal Governor, Dr BD Mishra while addressing the XIXth Conference of Higher and Technical Education. The Governor of Arunachal Pradesh Brig. (Dr.) B.D. Mishra (Retd.) attended the XIXth Conference of Higher and Technical Education, Arunachal Pradesh at Itanagar on 7th March 2019. The Governor inaugurated the two-day annual conference by lighting the inaugural lamp. Speaking on the occasion, the Governor said that objective of education is progress, peace, production, prosperity, preservation of the environment, protection of health and posterity care. It is the foundation for a strong and vibrant nation, he said while underscoring that education is more essential than hospitals, weapon systems and all engineering fields. Emphasizing on the significance of education, the Governor said that if there is a compromise in education, it is a compromise of the next generational leadership. The Governor said that teacher and student are two important entities in the promotion of education. The teachers must be trained and provided all amenities and they must carry out research and develop innovative teaching concepts. Unless the importance of the teacher is enhanced, the society cannot advance. At the same time, the students must rise above ‘Certificate – government job’ syndrome and become job providers for society to take the nation forward. The Governor exhorted the officials responsible for higher education in the State, to think, explore, try and implement all the programmes and projects with all seriousness, to strengthen the education scenario in the State. He called upon those in management and administration of education to ensure progressive teaching and learning techniques, prevent fake certification and focus on placement and ranking of the educational institutes. 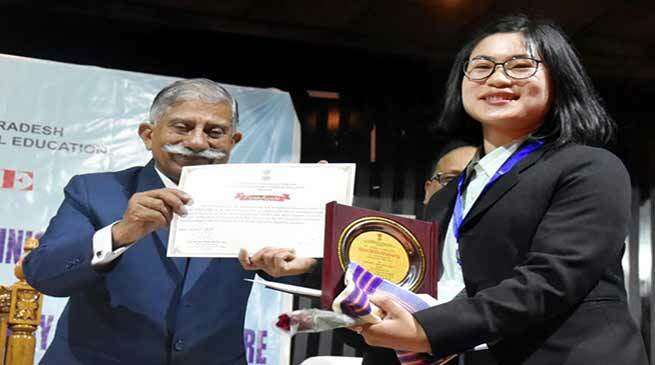 Visibly pleased that most of the awardees and toppers were girl students, the Governor said that this gives a good indication that Arunachali society is progressing and developing. The Governor released a book titled ‘Party Politics in Arunachal Pradesh’ by Sangja Khandu, Principal, Govt. College, Bomdila. He also released the SLQAC newsletter, NSS Newsletter and ‘Basic Information on Higher & Technical Education’ Arunachal Pradesh booklet. The Governor felicitated Tomar Ete, former Principal with the ‘Pioneer of Higher Education Award’ and Dr. Jajati K. Pattanaik, Associate Professor of Political Science from Jomin Tayeng Govt. Model Degree College, Roing with the ‘Outstanding College Teachers’ Award’ in the inaugural session of the two-day conference. The Governor gave away the ‘Governor’s Cash award’, which included a cash award of Rs. 10,000.00 (Rupees Ten Thousand) to Ms Gami Bogo, B.Sc. Botany from Jawaharlal Nehru College, Pasighat, Ms. Millo Mamung, B.A. from Saint Claret College, Ziro and Ms. Ansula Ngadong, B.Com. Don Bosco College, Itanagar, who are the toppers in undergraduate courses, under Rajiv Gandhi University, Rono Hills, Doimukh. Mr. Vishal Kumar Singh, Civil Engineering, Rajiv Gandhi Polytechnic, Itanagar received the ‘Arunachal Pradesh State Council for Technical Education Gold Medal’. Saint Claret College, Ziro received the ‘Best Performing Private College Award’. It also received the ‘Best NSS Unit Award’. Ms. Withoam Socia, Assistant Professor and Trained NSS Officer from Saint Claret College, Ziro received the ‘Best Project Officer Award’. Ms. Binde Maying from Rajiv Gandhi University, Rono Hills, Doimukh and Mr. Azad Tapak from Jawaharlal Nehru College, Pasighat received the ‘Best NSS Volunteer’s Award.